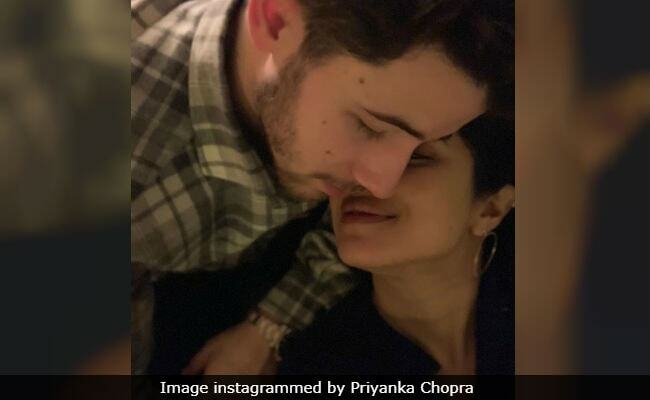 Priyanka Chopra and Nick Jonas are enjoying the Christmas and New Year's holiday season together as a married couple and they are totally mushy about it on social media. The Internet loves their Instagram PDA and Priyanka's recent post featuring Nick Jonas is proof. Priyanka shared a picture of herself with Nick without a caption (because a picture is worth a thousand words), which received over 1.8 million likes in just 13 hours. Priyanka's Instafam also posted adorable comments such as, "Priyanka and Nick your love is true" and "Priyanka and Nick your story is the best and beautiful." Priyanka Chopra and Nick Jonas are vacationing in London along with their respective families. Priyanka Chopra married Nick Jonas as per Christian traditions and then as per Hindu rituals in Jodhpur earlier this year. Nick and Priyanka hosted three receptions - one in New Delhi and two in Mumbai - after which the couple took off for the US in time to celebrate Christmas with the Jonas'. The entire family then took off for a vacation in London. On the work front, Priyanka Chopra is currently busy with The Sky Is Pink, co-starring Farhan Akhtar and Zaira Wasim. Priyanka co-produces the Shonali Bose-directed film with Siddharth Roy Kapur.